Guard Katie Smith, one of the most prolific scorers in WNBA history, brings her all-around game to Washington this season. "I don't feel like I have to put it all on my shoulders and score 20 a night," Smith said. "I feel like I have to do my part and be ready every night and do what is asked." 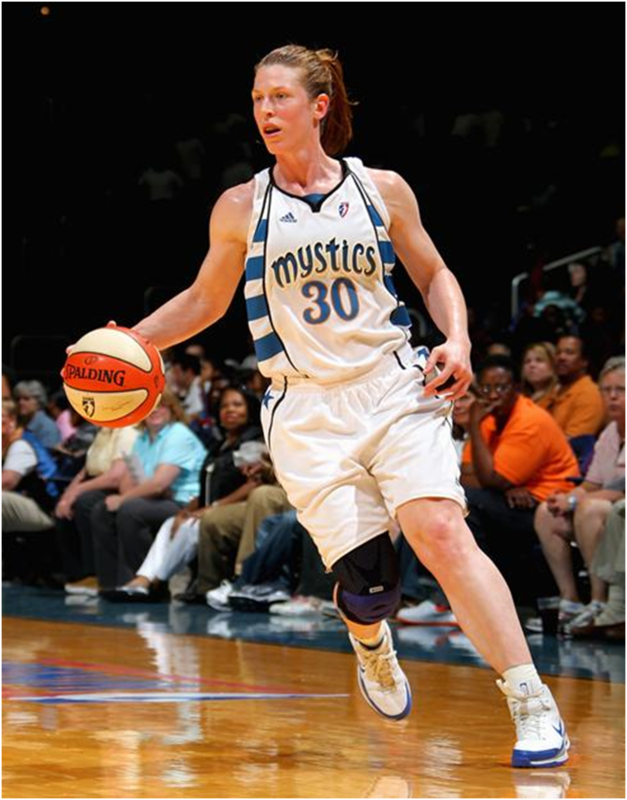 Three-time Olympic gold medalist and seven-time All-Star Katie Smith is set to tip off her 12th WNBA season Saturday when her Washington Mystics face the defending Eastern Conference champion Indiana Fever. Smith, who won two WNBA championships with the Detroit Shock and is the all-time leading scorer in American women's professional basketball history with 6,879 career points, talked to USA TODAY's Ellen J. Horrow about the Mystics, her future and reality TV. USA TODAY: You were hampered by back pain that forced you to miss the 2009 playoffs. Is that all cleared up and are you good to go? Katie Smith: I had a herniated disc and I had some numbness and weakness in my leg. Obviously I couldn't quite get out there with everybody. It took a long time. It was a slow process, but I did get to go overseas. I've been feeling really good, and I've worked hard at strengthening and whatnot. On top of that, the body just had to kind of heal itself when it came to the nerve damage. But I feel good and I'm ready to roll. USA TODAY: For the first time in your illustrious career, you were an unrestricted free agent and had the opportunity to sign with any team in the league. Why the Washington Mystics? Katie Smith: When our team [the Detroit Shock] got sold, Tulsa wasn't exactly where I wanted to finish my career. I wanted to go somewhere where the fans, the team, and the organization had been around and established. I think the Washington coaching staff was a big draw; she was [Julie Plank] somebody who I was familiar with, who I could trust. On top of that, the success of the players; they play hard. Being close to home is also key. It's not a bad drive from Columbus (Ohio) to here. So it's kind of a combination of all those things. I'm just excited to be here. USA TODAY: At any time, did you consider possibly re-signing with the Shock, even though the team moved from Detroit to Tulsa? Katie Smith: If it was in Detroit, it would be a little different story. Deanna Nolan was probably not going to play. We knew that kind of early, right after we got sold. Some things changed and the coaching staff was different. All of those things kind of played into maybe moving on and venturing out to somewhere else. This is my first time being able to choose where I wanted to play. I've always gotten either allocated or traded. Obviously I love Detroit, but this is the first time I got to choose and I'm excited about it. I think after the coaching staff and some of the players left, it was time to move on for me. I wish could steal a couple [of players] and bring them with me here to D.C.
USA TODAY: You spent four-plus seasons in Detroit and won two championships there. What was your reaction when you found out the Shock, after all its success, would be leaving Detroit? Katie Smith: We were shocked. We knew that we weren't doing great. We knew that it was a possibility, if not this year, then maybe next year. After Mr. D. [owner Bill Davidson] died, there were changes and things were different on both the women's side and with the Pistons. We knew that we weren't doing great, but we did not see that one coming as soon as it did. We were really surprised about that and it was hard. You have such a history. It's kind of like the Houston Comets being basically dispersed. It's two storied franchises and you have such a history and then it's gone. It wasn't a happy time and I will just always remember my good times there. USA TODAY: In Washington, circumstances are a bit different now from when you first signed with the Mystics a month and a half ago. You lost All-Star teammate Alana Beard to an ankle injury, and she's presumably out for the season. Obviously, it's a huge loss for the Mystics. How much do you think that will change the dynamics of the team? Katie Smith: Of course the dynamic is a little different. Alana is a huge part of everything on both ends of the floor. So having her gone, honestly, I feel our margin of error is a lot smaller. I think that all of us have to be tuned in; everybody has to be focused every night. You can't take a night off. You can't have six show up and four still at the hotel hanging out. All 10 are going to have to be locked into the game plan and understand how important it will be. I was looking forward to playing with Alana and I'm happy she's taking care of herself, but I think we have enough talent as a group. I think certain nights, certain people will step up. We're just excited and learning each other and trying to find our way. One thing's for sure, we're going to compete every night and that's half the battle right there. USA TODAY: How does the loss of Beard affect you in particular and your responsibilities, both on and off the court? Will you end up playing more minutes than maybe you anticipated? Katie Smith: There's probably a tad bit more pressure from the outside. I just think it's knowing that you have to show up every night. For me, it's all the little things like knocking down shots when you get them, playing good defense, and setting good picks. It's kind of the same. I don't feel like I have to put it all on my shoulders and score 20 a night. I feel like I have to do my part and be ready every night and do what is asked. I think my role is pretty much the same. I think all of us just have to be ready every night for whatever is needed. And I think that everybody is willing to do that. USA TODAY: One player who stepped up big time for the Mystics last year was point guard Lindsey Harding. With Beard out, do you foresee Harding taking on an even bigger role, especially on the offensive end? Katie Smith: I think her role was huge last year. I think she sets the tone for this team, both defensively and offensively. She's key offensively, being able to create for herself but also create for everyone else and get us in our sets. She's such a threat against other people and defensively she's so hard to play against. She's our engine and we have to keep up and hope to make her life easier. She's a huge, huge part of this team and I hope I can help her out. USA TODAY: Whenever your WNBA career comes to a close, would you like to stay in basketball, as say a coach or a commentator, or do you still plan to pursue dentistry? Katie Smith: I've really been back and forth about this for a lot of years. I'm really kind of looking forward to maybe going to school and pursuing dentistry, but I do want to stay involved with basketball. I feel like it's given me so much and I love it. I really don't want to get away from it, but as my full time occupation, maybe not. But I definitely want to stay in it in some sense. I want to give back to something that's been so good to me. USA TODAY: Now for a few less serious questions before we wrap up. You've won three Olympic gold medals. Basketball aside, what was your favorite Olympic city: Sydney, Athens or Beijing? Katie Smith: I have to go with Sydney. Australia is a great place. USA TODAY: You are an Ohio State graduate. Which Buckeyes team wins a national championship next: football, men's basketball or women's basketball? Katie Smith: Evan Turner just left but they're getting some good ones, so I'd have to go with men's basketball. I'd like to say women's but I'm not too sure, so I'm going to go with the men's. USA TODAY: You're asked to participate on a reality TV show and saying no is not an option. Which do you choose: American Idol, Dancing with the Stars or Survivor? Katie Smith: Dancing with the Stars so I can show off my skills. USA TODAY: You can only drink one beverage other than water for the rest of your life. What's your drink of choice? Katie Smith: Coffee, but every once in a while I like carbonation. USA TODAY: You're offered front row or box seats to one of the following events: the Super Bowl, Wimbledon, the Academy Awards, the Grammy Awards or a presidential inauguration. Which do you choose? Katie Smith: The Grammy Awards.